← Hot Air Balloon Ride… FINALLY! 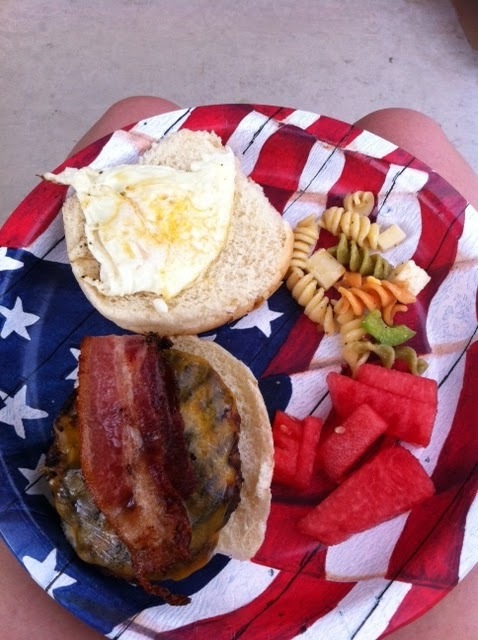 The past two days I have been heading to various BBQs and pool parties. 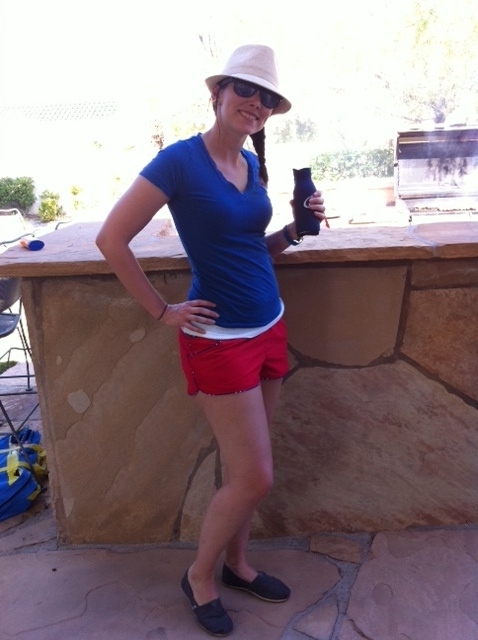 On Sunday I didn’t dress too festively, I was saving it up for the 4th. I had a great time with friends and making some new friends. I didn’t take a lot of pictures, but I think these 3 pretty much sum up my day. The food was awesome. I started with a bacon egg and cheese burger. First time I tried an egg on a burger, and it will most definitely not be the last! OMG AMAZING!! Seriously the runny egg yolk and the smoked bacon were unreal good! The watermelon was soaked in vodka (didn’t know that when I got it) and you couldn’t really taste it. The pasta salad was INCREDIBLE!! I think I’m going to make my own variation once a week and just live off of it! Don’t let the small portion fool you, I had multiple plates of pasta salad throughout the day. Things I ate that weren’t pictured: hot dog, a jello cupcake with cool whip and a strawberry on top, lots of sugar cookies with frosting, and pretzel rods dipped in chocolate! No holiday is complete without some temporary tattoos! 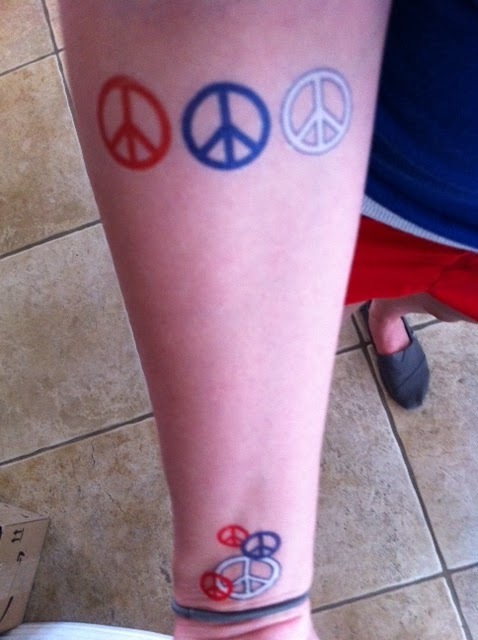 Since I had peace sign earrings in, it only seemed fitting to have peace sign tats! They were fun, I should have kept them on for work this morning! At night I met up with FF5 (he had to work) and we watched some fireworks. We went to a hill near his place and could see firework shows going on around the Vegas valley, nothing to up close, but at least we got to see some fireworks! That’s a quick overview of my 4th of July! Since I worked today I didn’t drink much, just a couple coronas (so unamerican of me!). But everyone else was getting nice and drunk off of survivor inferno flip cup, looked like fun but I was going for the no hangover at work thing so I passed. What did you do for the 4th?? And what about that Casey Anthony verdict? ?